Congratulations to our Client Jill-e Designs for their feature on Fox 4 News! 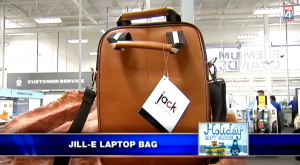 Jill-e Designs offers the most extensive selection anywhere of bags for mobile display devices, from fashionable to casual, from close-fitting upright carriers to briefcase-style messengers, for any laptop, tablet or e-reader up to 15â€. Including a portfolio of bags designed exclusively for the Apple MacBook and iPad. The Jack Lenox, is a slim, sleek, versatile leather laptop satchel, roomy enough for your 15â€³ laptop and all of your essentials! It’s unique vertical orientation provides a zippered main compartment, padded interior pouch to protect a laptop or tablet and interior pockets for smart phone, credit cards, travel documents, business cards and more. Look your best. Do your best. Check them out at jill-e.com!